GM's brand new Ecotec engine promises superior fuel economy and smoother running than any three-cylinder on the market today. It's just like the V8 wars of yesteryear, only much much smaller. Debuting in the Opel/Vauxhall Adam, the new GM three-cylinder produces 90 or 115 horsepower depending on the tune, while torque is 122 ft.lb from 1,800 rpm to 4,700 rpm. The engine is mated to a new lightweight six-speed manual to complete the package. The next generation might, but in this round, it&apos;s all Fiat 500 for you America! 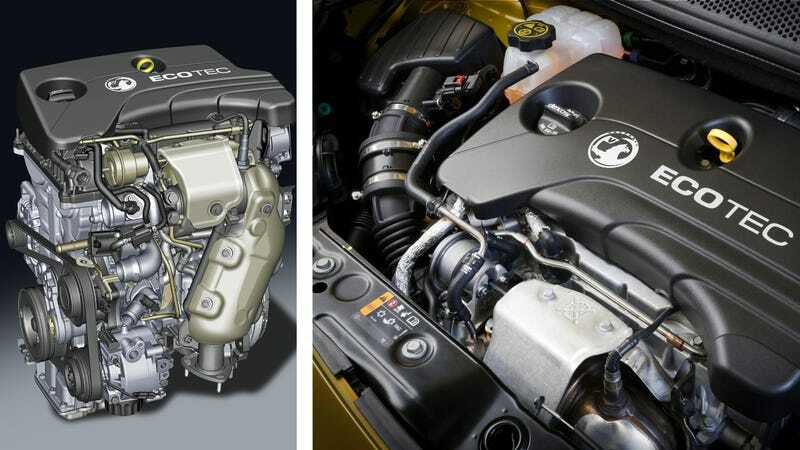 Looking at Ford's figures (99-125 hp, 125 lb.ft from 1,400–4,500 rpm and 148 lb.ft on overboost), GM's answer doesn't look that convincing, but they say their all-aluminum direct injection turbo petrol is the smoothest running three-cylinder yet while it can also give the Adam hatchback 51.6 mpg on the combined cycle compared to the 1.o Ford Fiesta's 45 mpg. The new six-speed manual 30 per cent lighter than its predecessor at 81 pounds. The cylinder block, in high pressure die-cast aluminum, is designed to reduce radiated and structure-borne engine noise, as well as reduce weight. The high-pressure fuel rail and injectors are also structurally isolated from the cylinder head to minimize the transmission of pulsing, while both the fuel pump and fuel line are acoustically treated. A further contributor to running refinement is the installation of a balance shaft in the oil sump. Driven by a chain with inverted teeth for quiet running, it counter-rotates at crankshaft speed and is carefully mass-optimized to offset the inherent vibrations of a three cylinder operation. Other noise attenuation measures include: acoustically-optimized covers for the top and front of the engine, the intake manifold and camshaft housings; crankshaft isolation with iron main bearing inserts; inverted teeth for camshaft drive chains; a low-hiss turbo charger, and a lower oil pan in steel. The big three is getting smaller.